What can you possibly say about the woman who tamed Johnny Cash? Before there was a Women’s Liberation Movement, June Carter was hitching logs to traces, sowing crops, sewing clothes, and even pursuing a career in show business as, first a comedienne, then as a singer. She even went to New York to study and pursue a career on stage. This was not your typical girl from the sticks. And she did it all while staying true to her Christian beliefs; which given the times and places required of her work; was no easy achievement. In this slim, less than 150 page book, June Carter Cash; of the Carter Family fame, as in A.P. 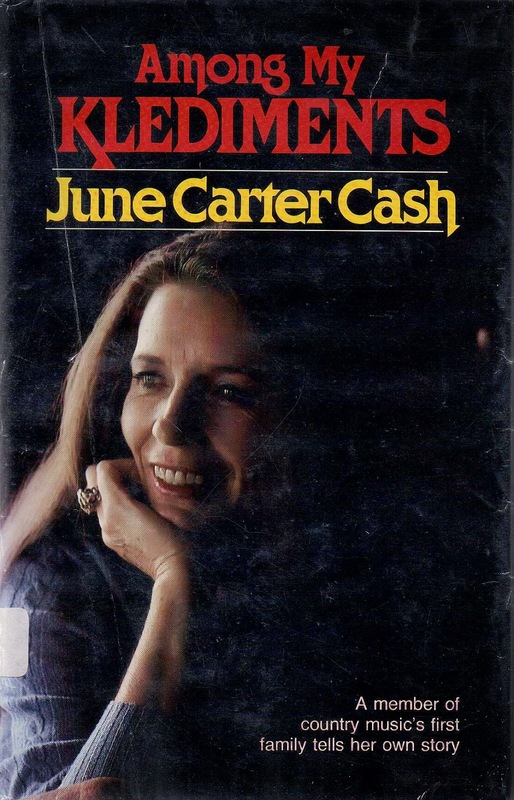 Carter, Mother Maybelle, and even a cousin named Jimmy; writes unflinchingly of her own feelings of failure in her first 2 marriages before becoming Mrs. Cash in 1967. Without contradiction she talks about how her own work schedule may have helped in the dissolution of those relationships; the first of which brought her 2 daughters. Her life before all that began in the hills of Virginia, listening and playing music. Most of the music of the Carter family has its roots in the traditional ballads and poems which came over with the settlers. Since many couldn't read, they sang the verses, giving birth to Appalachian music. A.P. Carter was just the guy who collected it all and wrote it down; as well as played it. Ms. Cash recounts her father’s struggle with alcohol and also how his life was changed; as was the case with Johnny Cash years later; by a strong relationship with Christ. This is one of those tricky subjects to work into a book without coming off as too “preachy”. Some might find it offensive, or uninteresting; but this is a large part; a very large part; of who she was, and just as with Ricky Skaggs memoir, to leave out her faith would be to tell an incomplete story. Indeed, as a Jewish person long a fan of Both John and June Cash, I found her expressions of her religious faith to be both sincere and informed. For instance; she considered herself to be a Seventh Day Adventist Baptist Methodist Pentecostal Jew. She believed in the 7th day as the Sabbath and that she was an engrafted Jew. (If you are unfamiliar with that last term then you should read Romans 11 in the New Testament. As a Jew I find that to be a major key in understanding Christianity.) This is tantamount to saying that Jesus was a Jew, and by extension all Christians are Jews; just as all Jews are Christians; and a remarkable thing for a Born Again Christian to state. Another part of the book which I found of particular interest is the section dealing with her radio appearances in Charlotte on radio station WBT in the early 1940’s. Mother Maybelle and her daughters sang on the Grady Cole Show each morning. I’m trying to find some of those recordings if they even exist. Her descriptions of the city are vibrant and much more appealing than the corporate town which has developed in its place since that era. WBT is still a Colossus of the South at 50,000 watts; though nowadays you only get traffic and news in the morning. No more Mother Maybelle Carter. And Grady Cole is a small venue stadium located south of “uptown”. Younger people don’t even remember his name. Her first meetings with Johnny Cash while working on tour with him are really interesting. If you don’t know much about John and June Cash beyond that movie which came out a couple of years ago, I’d recommend reading this book for a more accurate account of their relationship. Her description of Johnny walking the beach all night long is haunting; as it should be. He was haunted at the time by demons that would only be conquered by his love for Ms. Carter and his own religious faith. And when he did decide to kick drugs he put up one hell of a fight. Ms. Cash describes it as being the toughest battle Satan ever fought; and lost. You might laugh, but this is some good writing! I was cheering for Johnny the whole time; literally. Along the way this amazing woman becomes a member of the Grand Old Opry; only to resign later for spiritual reasons; and even meets and works with a young man named Chester Atkins, whom she has to teach to laugh on stage. He is just one of the many "royals" of country music with whom she has appeared over the years; and befriended in the bargain. If you've already read Johnny Cash’s own autobiography I hope that you will not dismiss this as just another book by a celebrity wife. June Carter Cash was so much more than that. Don’t take my word for it; pick it up and find out for yourself. The video below is not the live performance I was looking for, but it's pretty good. It is a song about 2 people in love who each promise to wait for the other on the "far side of the Jordan". When June died before him she knew he'd be coming soon; just as he knew that she'd be waiting. And I have no doubt about that either.